In this installment of exhibits at the New York National Auto Show, the lead image shows a popular Ford Motor Company booth at the 1935 Exposition. 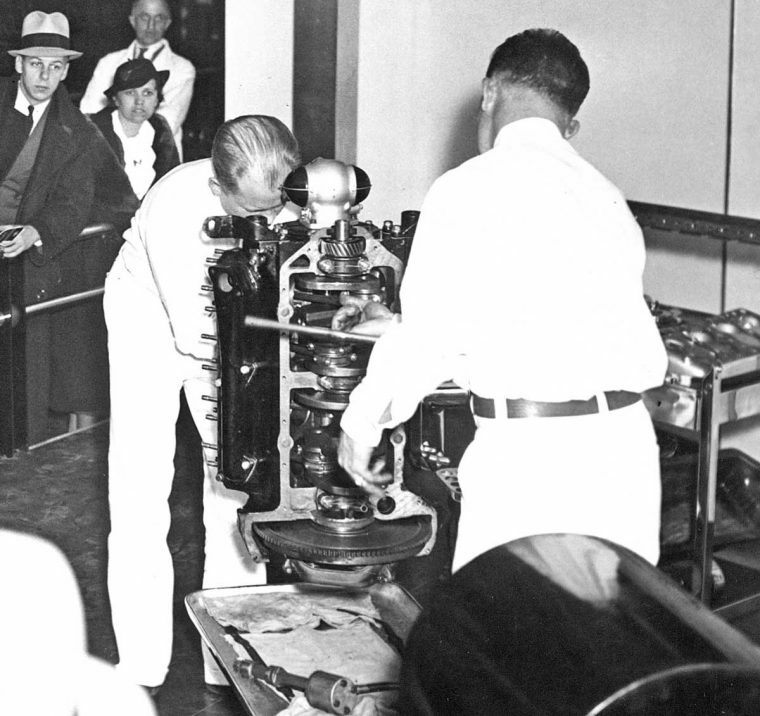 In an effort to entertain and draw show-goers into Ford’s large series of displays, an announcer explains the process and the engine parts used in the assembly and disassembly of the engine while two skilled mechanics work against the clock on the wall. Enlargeable view of the engine assembly at the five-plus minute mark. Retired racing driver Barney Oldfield made the rounds on the National Show circuit in 1935 as a representative for Plymouth. 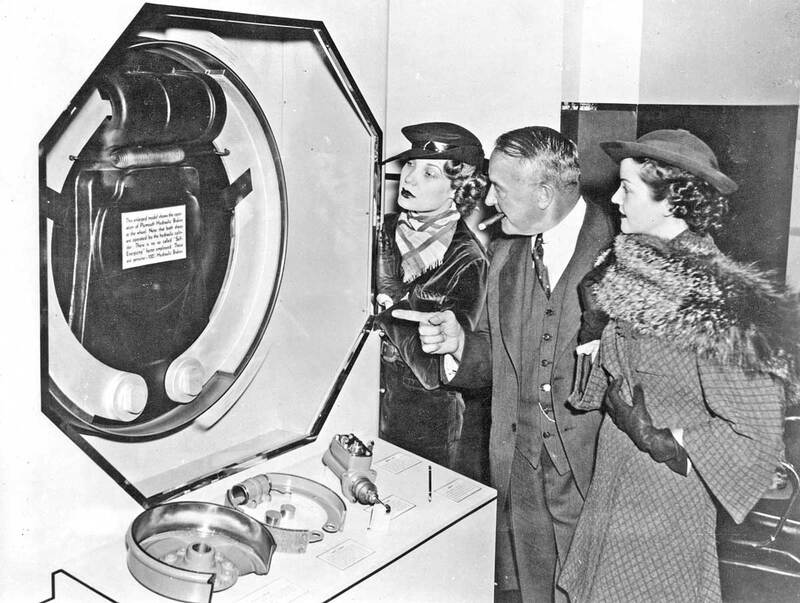 He is pictured here in a publicity shot with two models pointing at an enlarged version of the automaker’s hydraulic brake. 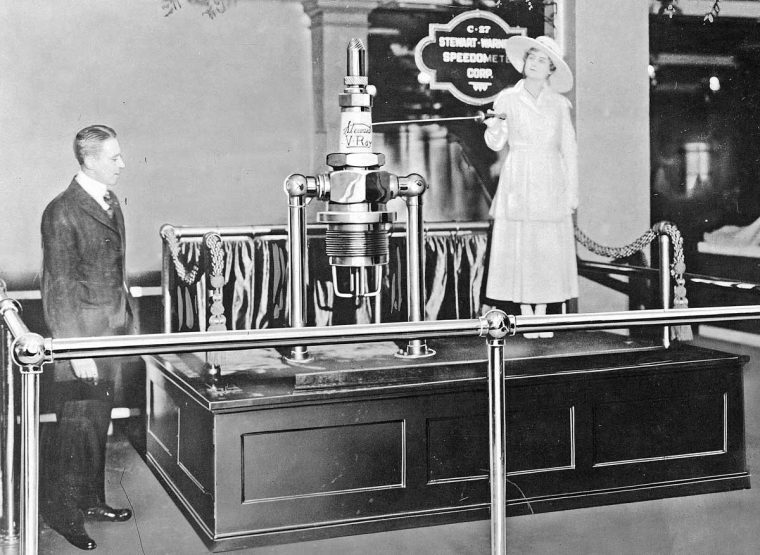 Earlier in this series the Stewart-Warner vacuum tank was featured and today the Company’s “V-Ray” spark plug display is featured at the show in 1917. It uses a long single center, and multiple side electrodes. It is only one of many this type of plug on the market at the time. Share with us what you find of interest in the photographs courtesy of the Free Library of Philadelphia. This entry was posted in Auto photos 1885 - 1920, Auto photos 1946 - 1965, Technical Features and tagged Flathead Ford V-8 Assembly, hydraulic brakes, multiple side electrode sparkplug, New York National Auto Show. Bad on Barney to not make sure his two model friends don’t have cigars too. On the Great Northern Empire Builder trip from Spokane to Chicago in about 1943, my Mother played canasta or bridge in the club car and was paired with Mr. Oldfield. Many years later she commented about his (apparently) ever present cigar. Non smoking areas weren’t available, then. it looks like the lady in the spark plug photo is pointing with a sword, doesn’t it? the blade if flat in the photo? 1) The people are very well-dressed. I so wish that were true today. 2) The world was a different place when cigars were routine. I’m glad it’s not so today. 3) The spark-plug photo is old, but it almost looks as those people were photoshopped into place. Mike, I fully agree with the sentiment you expressed in point 1. People then had pride and cared how they looked. The fellow in the bow tie is especially dapper. I am not advocating a return to wearing neck ties around the house or suits to the ball game and fishing stream as old photos portray. But these days, we’ve lost an element of elegance and self-worth. There is little pride today; you can wear your ballcap backwards, an old t-shirt and jeans to the finest restaurants and no one blinks. The general decline in manners has followed. It’s sad. Even US troops in WWII were admonished about wearing their ties, even in combat! People nowadays seem to have no self-awareness of their appearance. If they could see themselves as others see them, they might have a bit more pride in how they look to the world. I’m in the legal profession and am constantly sadden by the way people dress to attend court – and that includes even jurors ! Interestingly, in the top photo, it’s only the young guy in the checked scarf that isn’t wearing a hat – a sign of things to come ? Thank you–I am glad to see I am not the only one lamenting today’s dress code. By the way, the picture of Barney Oldfield reminds me of when my wife and I visit a museum like The Henry Ford or The Smithsonian. When we get to the Machinery Exhibits, the lady on Barney’s right looks as interested as my wife when I try to point out the significance of various cars or pieces of equipment. But I am thankful she is a good sport about coming with me in the first place! What you have is so very true. There are many more things that are lost. I put the blame on the 1960s radicals disrespect for the loss. Even today I still can see their attitude in their millennial great-grandchildren of today. I was under the impression the flat heads had the oil pump integral in the back of the block. There appears to be a pump on the table. Can anyone give more information on this. In the original flathead V8, the oil pump was driven off the same gear as was the cam in the front of the engine. The shaft was parallel to the crankshaft. The oil pump was short and fit into the space before the first crankshaft counterweight. You can find pictures of this if you search for the-history-of-fords-iconic-flathead-engine. In the later engines as shown in the picture here, the oil pump sticks down into the sump in a vertical position and driven off the cam through in intermediate gear. There is a hole for the oil pump at the rear of the engine just to the side off the rear main bearing. In my opinion, the engines in cars in 20’s and 30’s were things of beauty, especially in the high priced cars. Today the engine is covered in plastic as if the designers were ashamed of it. Thanks for the oil pump input. Now I have something new to research. An ad for the Stewart V-Ray Spark Plug stated, “The Stewart V-Ray Spark Plug will tone up your Ford motor to its very highest efficiency. Has four sparking points instead of only one or two.” Cost: $1. The V-Ray Spark Plug was manufactured by the Marshalltown Motor Material Manufacturing Company of Marshalltown, Iowa starting in March 1911. The “V” was a small notch at the end of the electrodes. Stewart purchased Marshalltown Motor Material Mfg. Co. in the summer of 1916. The attached ad is from November 1916, so shortly after Stewart bought Marshalltown. And two-toned cars and vent windows and……..
Gapping a set of those V-Ray things must’ve been fun. Nice to see people dressed well , even at funerals and church people don’t dress up anymore. I used to smoke cigars I can’t imagine how may people I offended , well I am now 83 and it didn’t kill me hope it didn’t anyone either. 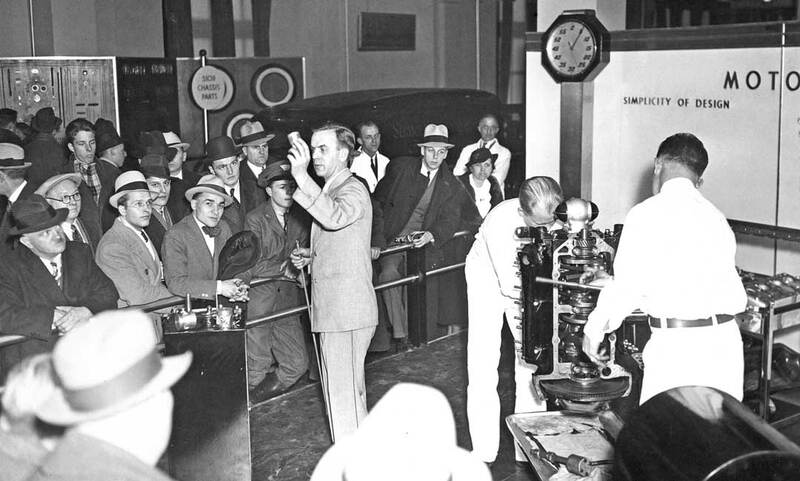 Time Traveler Alert, man in white hat, third from left looks like Paul Newman ! !